...is a repeat from last Friday. I love this music. Love it. The singing is in French, and I don't understand it (without the translation in the CD insert). Nonetheless, I love it. It is Celtic music with the flavor of Renaissance. I have it in and up loud. Listen to this sample which is my favorite tract even though the sample misses the beautiful beginning of the piece "When He was Born." This will have to go on my wish list for next year. I studied French four years in high school (and remember very little). Watching your recommendation, To Be and To Have was such a fun experience--hearing normal French conversation and picking up tidbits of meaning. 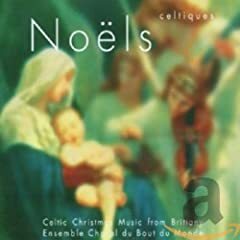 It might be fun to listen to Noël and try to catch familiar words. The music is very lovely.